When one enrols in pastry school, keeping a healthy diet proves to be challenging. Although I think I do pretty good in refraining myself from gobble up all the goodies I make, there are some pastries that are simply irresistible. Case in point, the freshly made danish. Or yeasted laminated dough in general. I told you that I have fresh artisan breads for dinners in the past 2 weeks. But I deliberately left out the details of the sinful breakfasts I partook in that 2 glorious weeks- super flaky, buttery, arteries clogging croissants and danish pastries. 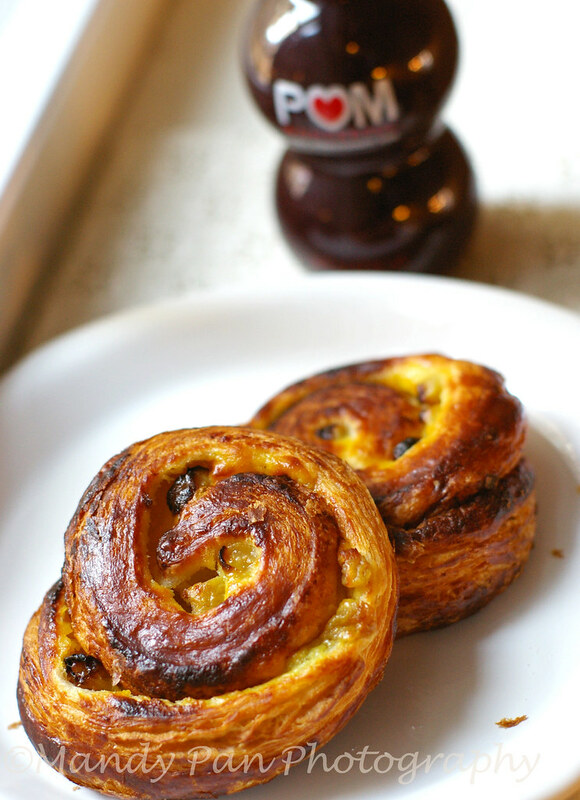 The phenomenal croissants is worthy of a post on its own, so let's focus on danish now, shall we? Although I have made danish with the Daring Bakers before, making this breakfast pastries in class is a totally different experience. Depending on the time of the year and the temperature in the room, dealing with a large amount of butter in a recipe is never an easy feat. For that reason, having ample cooler and freezer space is anytime an unspoken advantage. I remember rearranging my "well stocked" cooler and freezer when I was attempting to chill the danish dough for danish braid last year, and it was a real pain. Cooling space aside, having a machine to roll out the dough is another reason to bring smile to my face. I fell in love with the sheeter the first time I used it. I think of sheeter as a big pasta machine ,it can roll out any kind of dough in no time. Typically used in laminating dough to minimise contact time, which may result in melting the butter in the dough. My friend told me that the bakery she staged at used a sheeter to roll out cookies dough. Using just 2 fingers, I can have the danish dough roll uniformly to the desired thickness. Pure bliss~ It's great time saver when dealing with a large batch. But rolling out by hands definitely feel more rewarding. A few weeks ago, a representative from POM Wonderful dropped me an email to see if I would be interested to try their 100% pomegranate juice. The answer, as you may already guessed, was YES! I must confess that I was too cheap to buy it from the grocery stores because I wasn't sure if I would like it. How typically unadventurous of me. Even though I love the lovely bottle the pomegranate juice comes in. 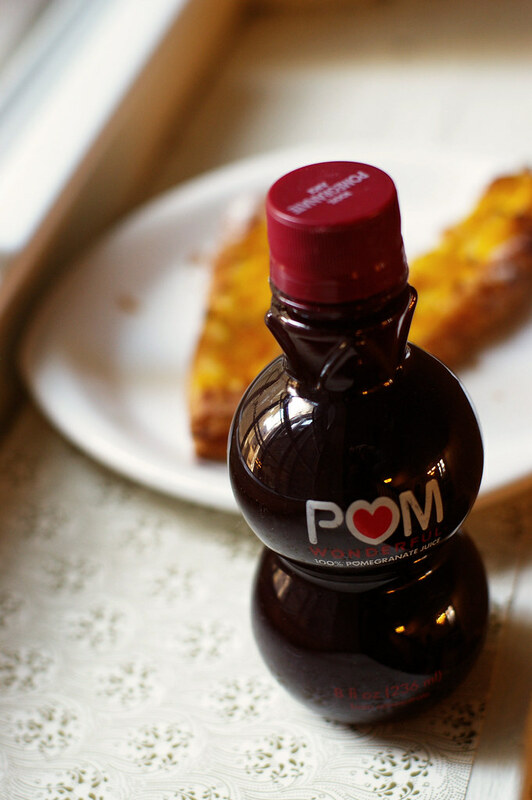 POM Wonderful's antioxidant power has well documented as significantly higher than red wines and other fruit juices. Other health benefits on cardiovascular, prostate and erectile function can be read from their website. Although according to the studies, one needs to drink the juice for a long duration to fully reap the claimed health benefits , I think it is definitely a healthy beverage option compared to many in the market. We had a pomegranate tree in the back yard when growing up, so I am no stranger to the fruit. I remember ripping open the red skin to messily digged out a lump of pomegranate pulps. They were then sent directly to my mouth. Taste of fresh pomegranate juice, extracted in my mouth. After that, a game of seeds spitting ensued, all in the name of hope - that some will grow into pomegranate trees the next day/week. The messy but delicious memory. My first sip of POM Wonderful juice reminds me of the fresh pomegranate juice I had in my childhood. They taste exactly the same! For this, I say "Good Job!" to the folks at POM wonderful for a great product. POM wonderful has some interesting recipes on their website, but I simply drink the juice as it is. After eating so many croissants and danish, I need to drink something wholesome to counteract the negative effects of overloaded butter. Pomegranate juice definitely fits the bill. Wow. I would have loved reading more about your experience with danish dough in class, but halfway through it turned into a commercial for pomegranate juice! How disappointing. I have read your blog for some time and always loved your posts and the "real" life they portrayed- unfortunately now you have lost some credibility with me (and I'm certain I'm not alone) and I will now view your posts with a healthy dose of skepticism, if I visit at all. So sad. What beautiful danishes you've created. There's no way I'd be able to resist. They look soooo good! I love Danish pastries they are so great. When we used to live in Sausalito, north of the golden gate bridge, there is this real danish bakery that I love so much. So many choices of Danish pastries. Yum. I am sorry you feel that way. I receive samples from companies from time to time. I review them on my blog if I like them, with full disclosure of the source of products (that is, I will mention I get them for free). If I don't like them, I won't even waste time and pixels to post them here. Also, the products reviewed here are all food related. I think my integrity is not compromised by reviewing products I like on my blog. That said, I certainly appreciate your feedback about product reviews post. 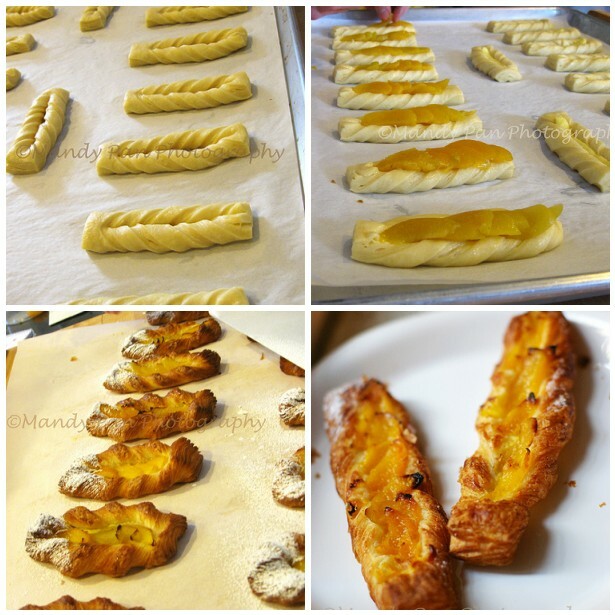 Hi Mandy, I love Danish breads too and the varieties they come in, can't say though that I am that perfect~o with playing with butter and dough ... I enjoyed the classes at the culinary institute. Once back home in Singapore, I have not tried that in the humid kitchen. The twists are beautiful. Is the centre strips hollow or there is base for the fruits and cream? Your danish are outstanding! I think if I wnet to pastry school they'd have to roll me to graduation! All I can say is "ummm,can I have one?" They look great! I don't really have danish pastries often but I've seen them a lot and I know..yours is good! It's hard to explain in words. If I ever make it again, I will take a step by step pictures for you.